Track your runs with GPS and altimeter. Pair your watch wirelessly with compatible gym equipment. Apple Watch Nike+ is swimproof⁴, so you can take a post-run dip in the pool. And built-in cellular¹ lets you stream your favorite music and get phone calls, messages, and notifications—even when you don’t have your phone. There are new Nike watch faces and two Nike bands: The Nike Sport Band with compression-molded perforations for breathability and the Nike Sport Loop woven with a special reflective thread. Want the same great features with a smaller watch face? 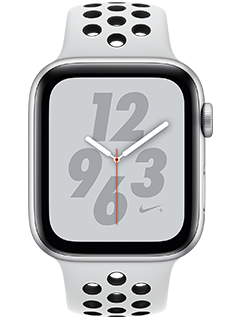 Check out the Apple Watch Series 4 Nike+ - 40mm. $60 CREDIT OFFER: Subject to change. Must purchase eligible device/have eligible devices and activate with eligible service. Eligible Devices: Requires (i) Apple Watch Series 4 GPS + Cellular purchase at full price, on installment agreement, or bring your own (excludes ones purchased on 2-year agreement) and (ii) HD-voice activated iPhone 6 or newer. Eligible Service: Both Apple Watch Series 4 and smartphone must be on same account with postpaid wireless voice & data services. (i) Apple Watch Series 4 requires min. $10/mo. when added to eligible shared plan;(ii) Smartphone requires min. $50/mo. for new svc with autopay and paperless bill discounts. Pay $60/mo. until discounts start w/in 2 bills. Bill Credit: Account and service on your line must remain active to get up to two credits ($30 service + Up to $30 activation) w/in 3 bills. No activation credit if already waived. Offer Limits: Max. of 1 activation credit/waiver per device. One credit offer per eligible Apple Watch Series 3 activation. May not be combinable with other offers, discounts, or credits. Purchase limits as low as 2 apply. Other restrictions apply. Device Limits: Apple Watch Series 4 requires AT&T NumberSync to access the AT&T cellular network. For SMS/MMS messaging, the synced iPhone must be on and connected to the AT&T network (via cellular or Wi-Fi connection; if using Wi-Fi connection, smartphone must have Wi-Fi calling activated). iMessage must be enabled on your iPhone. See www.att.com/numbersync for details. Usage charges apply. Gen. WIRELESS Svc: Subj. to Wireless Customer Agmt (att.com/wca). Svcs are not for resale. Deposit: may apply. Limits: Purch. limits apply (as low as 2). Prices may vary by location. Credit approval, taxes, fees, monthly, other charges, usage, speed, coverage & other restrs apply. See att.com/additionalcharges for details on fees & charges. AT&T service is subject to AT&T network management policies. See att.com/broadbandinfo for details. Pricing, promotion, terms, & restr's subject to change & may be modified or terminated at any time without notice.